Welcome to Advanced Accounting 4e! This book covers reporting for mergers and acquisitions, foreign currency transactions, hedges, state and local governments, not-for-profit organizations, plus specialized topics. Discussion of each topic focuses on key concepts, with many illustrations from practice, using familiar organizations. Emphasis is on the logic behind reporting standards and requirements, presented in a student-friendly way. Coverage is completely updated for the newest FASB and GASB pronouncements and proposals, as well as relevant IFRS. Illustrations of business practice are taken from current financial statements and events. The text has extensive student and instructor support. PowerPoint slides, eLecture videos, guided examples, and online homework and quizzes provide students with additional learning resources, and allow instructors to use class time efficiently and effectively. Advanced Accounting is intended for use, at either the undergraduate or graduate level, in the course commonly known as advanced accounting. It is also designed to be used in courses focusing on mergers and acquisitions that are often part of the MBA curriculum or that are offered as a nondegree, professional development program. Conceptual explanations focus on the logic underlying reporting standards. Each topic is developed by explaining the underlying business activity, the reporting goals, and how standards and procedures achieve these goals, using language students can understand. Illustrations from actual practice enhance understanding and familiarize students with the information presented in real financial statements. Reporting requirements are increasingly complex and require substantial judgment in their application. And standards change every year. Conceptual understanding prepares students to evaluate and effectively apply future standards throughout their professional careers. Mergers and acquisitions material is covered in Chapters 1–6. International subsidiary translation and consolidation, foreign currency transactions and hedging, and other financial derivatives (futures, options, and swaps) are in Chapters 7–9. Partnerships, bankruptcy and reorganization, and the SEC are covered in Chapters 14–16. Each chapter begins with a description of a familiar focus company, and how its activities and reporting practices relate to that chapter’s topics. 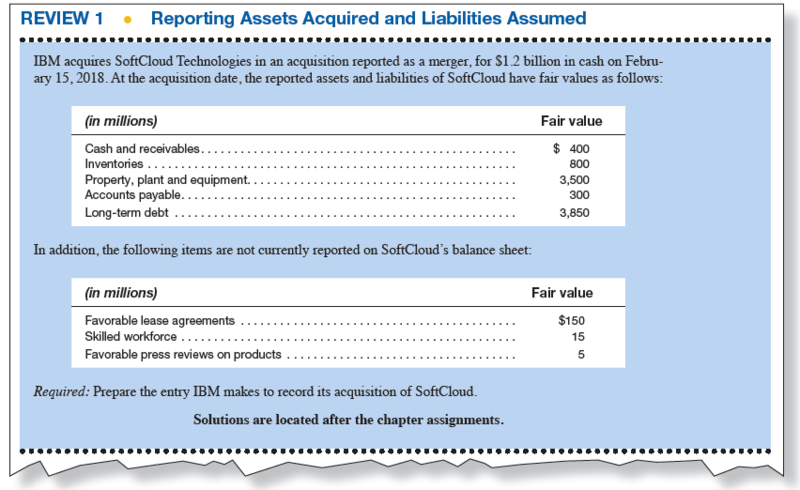 For example, in Chapter 2, IBM’s extensive acquisitions illustrate accounting for mergers and acquisitions. Noncontrolling interests are common in the resort industry, and in Chapter 5 Las Vegas Sands Corporation illustrates reporting for noncontrolling interests in subsidiaries. In Chapter 9, Kellogg’s hedging practices illustrate hedge accounting for futures, options and swaps. In Chapter 13, Beta Alpha Psi’s financial statements illustrate NFP reporting standards. Throughout each chapter, examples from actual practice highlight major topics, using either the focus company or other companies in the same industry. Following is a list of focus companies by chapter. Taken from current news and actual financial statements, Business Application boxes illustrate reporting practices, current issues, and controversies. Here is an example from Chapter 2, in the section covering valuation methods for assets acquired and liabilities assumed in a business combination. Reporting Perspectives comment on topics such as the strengths and weaknesses in reporting standards, motivations for changes in standards, ethical issues, implications for information quality, and proposals for new standards. The following is an example from Chapter 4. Extensive discussion and illustration of international financial reporting standards and proposals appear in each of the business combinations, foreign currency translation and transactions, and futures, options and swaps chapters. The following is an excerpt from Chapter 5. Illustrations of in practice are also provided. Here is an excerpt from Chapter 3. Reporting issues related to business combinations cover a variety of topics. Consolidation procedures are difficult to comprehend and can be confusing to students. Emphasis in this text is on the measurement aspects of combinations—reporting assets and liabilities acquired, determining acquisition cost, valuing noncontrolling interests, and eliminating intercompany accounts. The consolidation chapters start with the reasons why companies should consolidate and the goals of consolidation, and then explain how consolidation procedures achieve these goals. To make consolidation procedures more comprehensible, eliminations subsequent to acquisition (covered in Chapters 4–6) presume that the parent uses the complete (full) equity method. Exclusive use of the complete (full) equity method allows students to focus on the goals of consolidation and the key issues in consolidation procedures. Once students develop a solid understanding of the consolidation process, changes in procedures required when the parent uses the cost method can be introduced. The appendix to Chapter 4 explains the eliminating entries necessary to adjust the parent’s accounts to the complete equity method before proceeding as usual with consolidation. To reinforce concepts presented in each chapter and ensure student comprehension, each chapter has two or more In-Chapter Review Problems that require students to recall and apply the accounting techniques and concepts described in the chapter. The solutions to the review problems are included after each chapter’s assignments. The following example is from Chapter 2. Learning Objectives identify the primary learning outcomes for each chapter. An end-of-chapter Review of Key Concepts summarizes the key topics of each chapter. End-of-chapter questions, exercises and problems cover all major topics and have a range of difficulty levels, allowing students ample opportunity to practice their understanding of the chapter. Some problems require students to use real company data in applying their knowledge. Certain business combination problems continue from chapter to chapter. For example, P3.2 covers consolidation at the date of acquisition, and P4.9 covers consolidation of the same two companies in subsequent years. P4.3 covers subsequent year consolidation of a wholly owned subsidiary, and P5.7 addresses subsequent year consolidation of the same subsidiary, when the subsidiary has outside ownership. In P2.6, an acquisition is reported as a merger, and in P3.12 the same acquisition is reported as a stock investment and consolidation. P3.4, P4.5, P5.4 and P5.5 use the same acquisition data to illustrate consolidation of a bargain purchase at the date of acquisition, subsequent years, and with a noncontrolling interest. Each of these problems can also be assigned separately. In working through these problems, students gain a clearer understanding of accounting for business combinations, and how concepts learned in each chapter fit together. In the state and local government chapters, three problems for the same county take the student through preparation of financial statements for the general fund (P10.17), for other governmental and proprietary funds (P11.17), and culminating in preparation of the county’s government-wide statements, with reconciliations (P12.17). These problems can be assigned individually or as a class project. In the consolidation chapters, color is used pedagogically to identify eliminating entries, both in journal form and in the consolidation working papers, making it easier for students to navigate the complexities of consolidation procedures. All consolidation chapters emphasize consolidation of the statement of income and comprehensive income. Because in practice companies use a variety of formats to present consolidated operating results, the working paper consolidates the trial balances of the parent and subsidiary, which students then package into financial statements in whatever format desired. This approach increases students’ flexibility and understanding of basic concepts. Discussion of consolidation policy emphasizes the goal of consolidating controlled entities, and shows how FASB updates on consolidation policy illustrate this goal. Measurement issues in identifying and valuing acquired assets and liabilities and consideration paid are discussed in detail. Cost, market, and income approaches are explained and illustrated. Common reporting issues in practice, including identifiable intangibles, deferred taxes, and stock options, are covered, with examples from practice. In the governmental and not-for-profit chapters, concepts are illustrated with actual financial statements of cities, counties, states, and a variety of NFP organizations, with emphasis on ways in which the information provided by these entities differs from regular businesses, reasons why this information is required, and the judgments and choices involved. The commonality of reporting issues for different types of entities—businesses, NFPs, governments, and even partnerships—is emphasized. Examples include consolidation policy, acquisition reporting, and hedge accounting. The text is completely updated for new standards, proposals, and other relevant events as of 2018. Chapter 1: ASU 2016-01 and ASU 2016-13, investments in debt securities and equity securities with no significant influence; impairment testing for debt securities, and changes in the comparison of GAAP and IFRS for these investments. Chapter 2: Definition of a business (ASU 2017-01) determining when ASC Topic 805 requirements apply; reporting the effects of measurement period changes on subsequent income (ASU 2015-16). Chapter 4: Simplified goodwill impairment test (ASU 2017-04) and updated comparison of GAAP and IFRS for identifiable intangibles and goodwill. Chapters 8 and 9: New hedging model (ASU 2017-12). Chapters 10-12: GAAP hierarchy (SGAS 76), component unit display (SGAS 80), accounting for fiduciary activities (SGAS 84), leases (SGAS 87), defined benefit pensions and OPEBs (SGAS 68 and SGAS 75). Chapter 13: Completely updated for the new NFP reporting model (ASU 2016-14), including examples and illustrations from practice. All illustrations, current practices, and reporting perspectives are completely updated, and include new issues and examples. There are over 130 new exercises and problems, and a net increase of over 65 exercises and problems, at various levels of difficulty. The number of questions included in myBusinessCourse has been more than doubled with this new edition, as well. Susan S. Hamlen is the former Department Chair and Associate Professor of Accounting at the University at Buffalo School of Management. She received her PhD and MS at Purdue University and her BS at the University of California, Berkeley. Professor Hamlen is the author of Advanced Accounting 4e and previously co-authored 12 editions of advanced accounting texts. She has taught courses in advanced accounting for over twenty-four years and courses in financial accounting for over nine years, at the undegraduate and graduate levels. Professor Hamlen's research interests are in the area of reporting for financial derivatives and international reporting. She has publications in Journal of Derivatives Accounting, Theoretical Economics Letters, and in other accounting and analysis journals. Professor Hamlen is an active member of the American Accounting Association and other accounting, analysis, and business organizations. Excel spreadsheets for select assignments are provided on the book’s website. These spreadsheets will save time in data entry and allow students to dedicate additional time to learning the material. The Excel spreadsheets are identified by the Excel icon. Chapters 1-6 and 10 available. Others coming soon! Corrections that were made to the text after the first printing.